From the award winning author of Tipping the Velvet and Fingersmith, shortlisted for both the Orange and the Man Booker Prize. Now you know why you are drawn to me - why your flesh comes creeping to mine and what it comes for. Let it creep. From the dark heart of a Victorian prison, disgraced spiritualist Selina Dawes weaves an enigmatic spell. Is she a fraud or a prodigy? By the time it all begins to matter, you'll find yourself desperately wanting to believe in magic. Time for another joint review. This time it is with Kelly from The Written World (who has an awesome new blog template!). This time we are talking about Affinity by Sarah Waters - an author I have been meaning to read for ages but never quite managed to do so! Kelly's thoughts are in blue and mine in black! 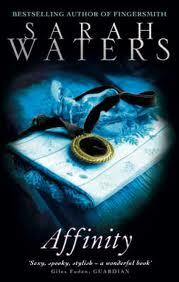 Kelly: I am always happy to pick-up a book by Sarah Waters. What did you think of this book overall? What made you choose it over the other Sarah Waters that you haven’t read yet? Marg: Actually, this is my first Sarah Waters, so the main reason for choosing it is that it is one of the Waters books that you haven’t read! How many have you read and how did this one compare to the others that you have read? Kelly: Really? I totally had it in my mind that you read The Night Watch. Well, you are in for some treats! I really liked The Night Watch because it takes place during WWII. I knew little to nothing about Sarah Waters, but the setting appealed to me and I decided that I had to read it. Then, I actually discovered that Waters was very popular and I had been missing out. The other book I read by her was Fingersmith. It seemed a lot different than The Night Watch. If I remember correctly, it has been a while, The Night Watch started from the end and went to the beginning. There were no real mysteries compared to the atmospheric novel Fingersmith. This book was a lot more like Fingersmith, though. It was gothic in nature, there were twists and turns (but not like Fingersmith), and you may or may not know how it was going to all play out in the end. I really enjoyed it, though. Fingersmith remains my favourite, though, and I just feel like The Night Watch is not something that really can be compared because it is different. What did you think of this book as your first taste of Sarah Waters, then? Marg: I own Night Watch. Just haven’t read it yet! I thought I had a fair idea of what to expect from a Sarah Waters book, but I found it quite a bit more literary than I thought it would be! The topic itself (spiritualism in the late 19th century) was fascinating but the strength of the book really was towards the end. The tension built and I couldn’t wait to see what happened. Kelly: I consider that her true talent. She writes interesting beginnings, but as the book gets going it really comes into its own and you are flipping the pages to find out just what is going to happen next. So far I have enjoyed that with all of them. I agree with this book that spiritualism in the late 19th century was a very interesting topic. She wrote so well that once in a while I almost believed in spiritualism. I was curious about how it was all going to be explained out in the end. Marg: I thought the characters were really well done. The major characters were all multi faceted and I thought that the way that the reliability of the two main characters was written was interesting. In a way, our main character Margaret seemed to be a bit of an unreliable narrator. We knew that she had had an illness (as described in the book) and she seemed to be unsure of herself, and especially of the things that were happening to her. She seemed to strengthen through the novel though. I felt so sorry for her at the end, especially in the light of the restrictions placed on women in Victorian society, especially those who don’t fit the mould of what is seen to be normal. With Selina’s past story interwoven through the narrative, I certainly started off with the assumption that she was a charlatan and yet as the spooky events started her character was so compelling it was hard to have doubts about her! I thought that the setting in the Victorian prison was totally a character in this book. The atmosphere was dark and brooding and very claustrophobic and the various warders helped create that feeling as well. Were there any of the episodes that Selina caused that were a bit scary to you? Kelly: I thought the characters were well done, too. Sarah Waters is very gifted at writing characters that stick with you long after finishing the book. Margaret and Selina are two such characters. I felt bad for Margaret. She was a lesbian in Victorian England. It was not exactly the accepted lifestyle. The first woman she loved married her brother and then the events of her relationship with Selina were heart-breaking at times. That was not exactly apparent from the beginning, but as we began to know Margaret better it became more apparent. This is the saddest book I have read by Waters so far. I agree. I never entirely trusted Selina, but the events she conducted were explained in such detail it was hard to see them as untrustworthy. I think that is what makes a gifted charlatan. If she wasn’t good at what she did; she would not have any customers. She was gifted at selling her act and making people feel compelled to do things for her. She just basically creeped me out, though. I am thinking it was because I had read Waters in past and knew there were usually major plot changes that lead me to not entirely trust Selina. There were just moments where I couldn’t entirely explain why what she was saying was a lie. I look at all the episodes that Selina caused as a whole and think she was just scary in general. She seemed like such an innocent, but there was a calculating mind behind everything she did. She was gifted at manipulating. Did you think the book was believable for the time in which it was set and the events that occurred? Marg: I definitely thought it reflected the time it was set in. To be a women in Victorian times was restrictive enough, let alone a lesbian woman, and throw in her health issues and it is no wonder that she was quite unhappy at times. I can’t help but be anxious that she is going to continue to be very unhappy after the events at the end of the book, and having to face her family will be difficult for her. Do you like the diary entry format of the story? Oh, pretty cover. I am torn on which I prefer myself. Thanks for reading and reviewing this with me! This is one of the books that I have wanted to read for the longest time, and it's also one of my longest shelf sitters. I need to get to it soon. Hearing you guys talk about it just reinforces that this is one that should not linger! Great joint review, you guys! I had been meaning to try Sarah Waters forever, so I am glad to have finally done so! This sounds fascinating, an unusual premise with unusual protagonists- a great paired review! Thanks Shelleyrae! It's always fun to do a joint review. I have also never read Sarah Waters, but have had her on my list for ages. Thanks for the reminder and great conversational review girls! I wish I hadn't left it quite so long really Jenny! I just got done reading your shared review at Kelly's blog. I don't know why I have waited so long to read anything by Sarah Waters. I have heard such good things....now I just have to decide WHICH ONE to start with! I don't know why I waited so long either! I think Night Watch will be my next - only because I have owned it for years and still haven't read it! I really enjoyed reading both your thoughts on this. I enjoyed Affinity, but my favourite is Fingersmith. Fingersmith does sound like a good read! Looking forward to getting to that one. This was my first book by Waters as well but it definitely won't be my last! I don't know how she did it but she managed to hook me completely into this book and I adored it. Thanks for sharing your thoughts on it! Do you know what you plan to read next Sam? This book blew my mind. I knew not to trust Selina, yet I was so embroiled in the story and could completely see how the narrator was taken in. Fingersmith was the first Waters I picked up. Most people say to read that last because it's so good (and it is fantastic), but I enjoyed Affinity for very different reasons. Hopping over to check out the rest of the conversation!